The Bond Street Teas VIP club is an exclusive tea service in which we will send you your chosen tea, directly to you every month through the post. You can change your tea selection at any time and also receive other benefits such as free tea tasting packs. 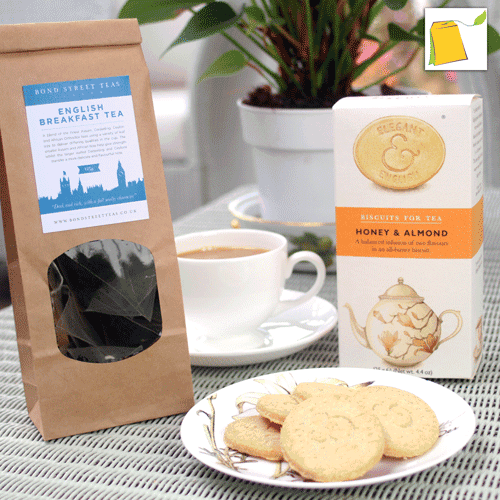 On joining the VIP club, you can select any tea from our range, plus any one of our biscuit ranges. We will send you an email detailing exactly how to make your selection. Each month we will send you a month’s supply of your chosen tea, and a packet of biscuits along with sample teas to try and free gifts. Free tasting samples – discover new and exciting flavours of tea, biscuits, chocolate and more! At any time, you can adjust your membership to change your selection of tea or biscuits. Also, you can add to your monthly parcel with any other items from our range. So, for example, if you would like x2 pouches of Assam tea, plus 1 each of our Peppermint and Jasmine teas, plus treat yourself with a bar of chocolate, just let us know and we will update your regular delivery. There are no additional service charges and you never pay P&P. You can make as many changes as you like during your subscription. By becoming a VIP member of Bond Street teas you can benefit having you tea delivered to your home monthly free of charge. You can select the type of tea and other additions each month, or stay with your favourite. You can order the right quantity to suit you, and what’s more, we will send you regular free samples of new exciting flavours to try. Discover the tastes of rare and unique teas from around the globe! How would you rate Bond Street Teas ?